GoFog Staging Racks make humidifying inside an AHU easy to control and even easier to install. The atomizing nozzles installed inside each AHU have an external control panel, with PLC and staging valves, that will modulate the humidifier output based on a BMS demand signal (0-10V or 4-20mA). The valve rack shown here uses (4) motorized ball valves (3-way) that provide (15) stages of capacity control by sequencing the valves. Attached to each of the valve’s discharge ports are manifolds inside the AHU with varying amounts of nozzles. Once the valve panel receives a BMS demand signal that is high enough to open the first stage, it sends out a pump request to the fog pump station. This provides 1,000 psi of reverse osmosis water to the nozzles. 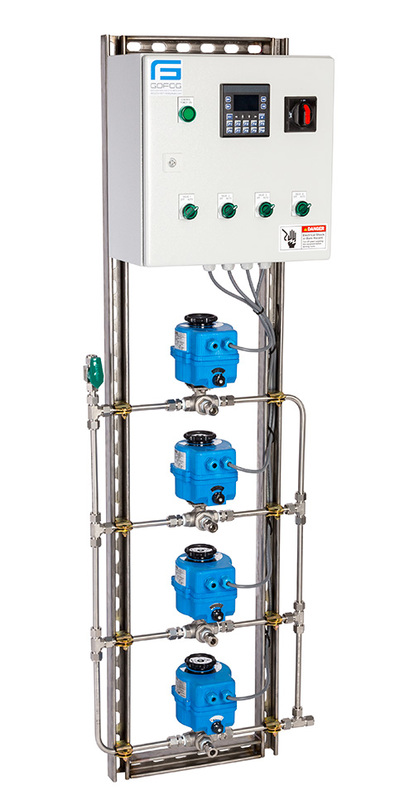 Programmable stage up/down time delays are included to prevent valve cycling. An automatic flush cycle keeps fresh water in the system. Optional inputs to accept a high limit sensor and air proving switch. Pre-piped and pre-wired, simplifying the installation by the mechanical contractor. Factory tested as a complete unit. Incorporates motorized ball valves instead of solenoid valves for quiet operation.